200km cycling event starting from Maidenhead, Riverside Gardens. Controls at Dorking, Petworth and Alton, plus 4 information controls. Online entry now closed. 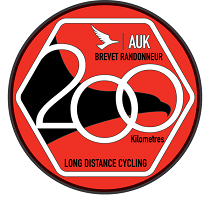 Entry on the day possible at �7.00 AUK/CTC members, �9.00 others. There are 12 places available. The ride takes in the North Downs, Leith Hill, Blackdown, Hindhead, the Hampshire Downs. Named in memory of Willesden CC's Jack Eason, Randonneur of the Millenium, who, when asked how he was getting on in a ride would often say 'Strugglin'. While the main climbs are some of the longest in the South East and give a challenge, the rest of the route is reasonably flat and takes you through through some lovely countryside on quiet roads. Recommend you use parking 700m north along the Thames from the start as the venue car park closes towards dusk. Check for engineering works if you plan to take the train. Suitable for 16 and over. There is extra information on the ride, including routesheet and GPS options, on the ride's website.